Leg day is usually the most dreaded, but this in-and-out trio of leg-wrenching tri-sets will give you a workout to remember! You absolutely have to train legs if you want a complete muscular physique. 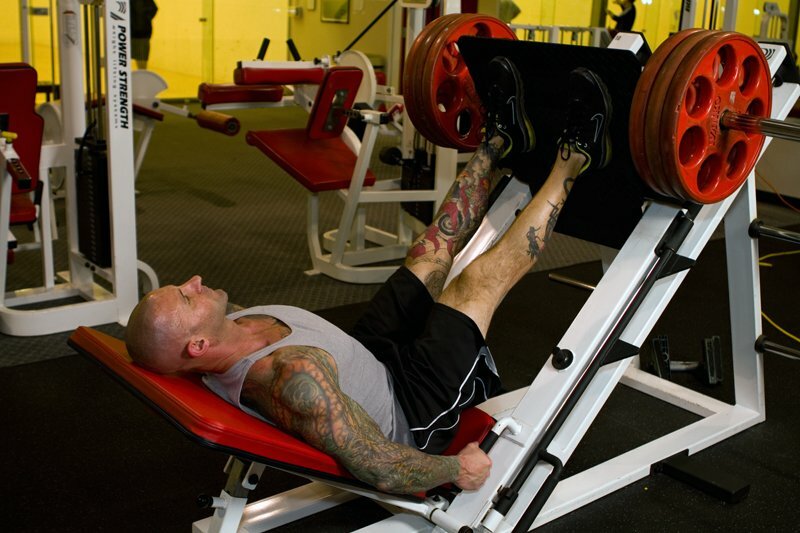 Leg workouts need to be intense in order to be effective. So prepare to work! A good leg workout can take as few as 45 minutes, so no excuses for skipping one! With each exercise, lift heavy so you can reach failure within the specified rep range. Complete each tri-set by performing every exercise within the round continuously. No rest. Repeat that tri-set after 1 minute of rest. Complete three rounds for each tri-set section. Once you've finished 3 rounds for the first tri-set, move to the next tri-set. How fast will it take YOU to complete, partner? faint of heart. Let's combine them! Tip: After your thighs reach parallel with the floor, explode on the way up. If using bodyweight is too easy, hold a weighted plate in your hands to increase the intensity. Tip: Stretch before starting this round, and make sure to get a good stretch while performing the stiff-legged deadlift. Tip: On the first round, perform all the exercises with your toes pointed straight forward. On the second round, point your toes outward. On the third, point your toes inward. This will allow you to nail all parts of your calves! This is a rotating workout, baby! That means the order of your tri-sets will change from week to week so your legs stay on their toes, so to speak. Here's the 3-week cycle. If I were you, I'd take your lower-body measurements right now, do this program for 9 weeks, take those same measurements again, and get ready because your jaw will hit the ground ... hard. Reinventing The Wheel! A New Training Philosophy For Killer Legs. 5 Leg Exercises When Knee Injuries Plague Your Training! Dramatic Transformation Principle: Build Some Killer Legs With This Routine!